As the week winds down, I’m still riding high from my success at Origins Game Fair. If you didn’t catch that article yet, you should go check it out. I had a phenomenal show this year. I’ve been trying very hard not to get my hopes up for Hedeby, but it’s difficult. Even if both of the games that are currently being looked over by publisher falls through, I know that I’ve developed some lasting relationships that I will be able to lean on in the future… and that’s the more meaningful success of the weekend. The problem I have now is… what do I take to GenCon? My dice game still needs a home, and I’ll be showing it to anyone that listens. I will also have Dead End ready to show, but I have a publisher picked out for that one all ready and we’ve discussed it at length. That leaves me with a month to bring something else to fruition that I might show. 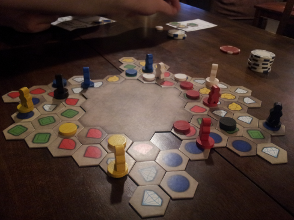 Hexploration is the one game I want to work on the most right now. I seriously doubt I will have a publisher-ready version by GenCon, but that’s okay. It will be present because I want to get some work done and some friends will be there that I would love to play the game with. After last year’s GenCon, I haven’t touched the game much. I made a bunch of rule changes that have never been tested, but which I think addresses most of the games issues. I hope to get in a few tests over the next couple of weeks so I can see where it is before I show up ready to change everything about it. Around the time I was set to attend Protospiel Milwaukee, I discussed a game idea with the dudes at Building the Game podcast. The game is a simple card-drafting game where the players are engaged in a semi-cooperative battle against the deck and each other. 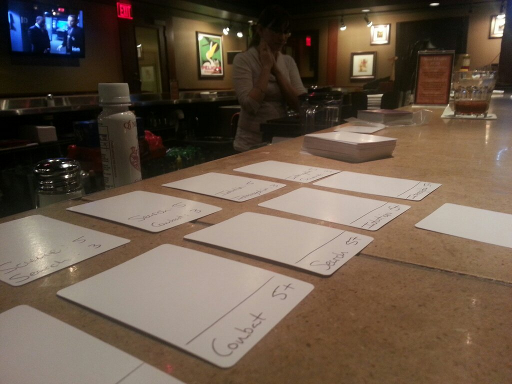 In essence, a number of cards are dealt out from the deck and each player drafts one in turn order. Then, the players must face the remaining cards. So, each card is sort of a duality: do I take this card that really helps me out or do I take that card because we can’t deal with the game effect? I never fully developed that idea. I had some thoughts, but just couldn’t put it on paper in a way that intrigued me. I think I have some new ideas that I want to try and I’m going to give it a go this month. I doubt it will be ready to pitch, but it should be ready to play. This game. This pile of cards. I’ve pounded on this game for so long and I feel that it has suffered for it. But, it’s getting close. I promise. I keep telling my co-designer, Neil, that I will write a new blog post soon, but I haven’t typed a single word. I promise you, the game has come a long way from where it was last August. Neil stepped up sometime last winter and asked if he could work on it. I gladly let him have it and do whatever he wanted. I told him I wouldn’t look at it until March (the one year anniversary) so he could do whatever. Well, he did great things and fixed many problems that the game was having. If you are really interested, you can read all about that on his blog someclosure.com. Neil brought it to Protospiel and I was able to try his new version for the first time. Many of his changes were awesome, some needed work. We both saw the same problems and we began tackling them. Since that time, we have revised the game twice and are now on our third (and what I hope is final) revision. Lucky for those of you that care about the game, Neil has done a great job of cataloging his thoughts and making up for my laziness. He has posted a bit about the last version of the game we tried just recently. You can read all about it here. I promise you. I will write about this game again. Seriously. I’m working on a graphical overhaul right now… I just need to find my reason for writing again.